Discussion in 'Sesame Street' started by Phillip, Apr 3, 2005. 1 Let's wait till 5/16 and see just which episode gets aired. Why I say that? Cause we know that the repeat business will get us 4092 this Thursday and another repeat from 34 or 35 on Friday. 2 DanteCat, if 4093 does air on your station on 5/24 and the rest of us are stuck on rerun mode, I'd greatly appreciate it if you could help with any and hopefully all new characters that show up in that episode. Let's take a deep breath and calm down and wait to see when the new episodes will finally come on air. 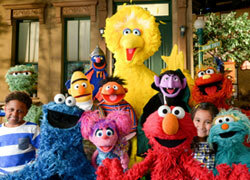 Why are PBS stations repeating the first 10 episodes of Sesame Street before they show all 26? They are approaching the third time of repeating them as of May 16 (the one with Joe Torre). My daughter has been waiting all year for new episodes and does want to constantly see the same first 10 over and over again. Just letting everyone know, the new season resumes September 5th. Wha?!? Aw man, that's 2 blows in one day, can't take much more. And here I thought we'd get 4093 on 5/24 as DanteCat reported. Guess that means Muppet Listings 16.0 will have to wait till then to be truly completed with SS Season 36. Eh, that's the problem with only 26 shows. Believe me, everyone at Sesame Workshop would like a lot more than that, and I know that we all would, too! I mean, I DO think it was DUMB to only air 10 shows, and then just go straight to repeats! I think they should have finished the season FIRST, and THEN thrown in repeats. But the thing is, they don't really like to air new episodes in the summer. I mean, kids wouldn't really be at home watching in the summer. They would be at camp, or on vacation. So, in a way, they're doing the right thing, but they also did the wrong thing by only airing 10 shows. I guess by summer they mean warm weather, because they woudl have had all 26 aired by now if they'd aired all 26 at once. But it'll still be awfully warm Sept. 5. At least it better be. Couple Sundays ago in OHio we had to scrape spring off our windsheilds. Because of broadcast rights, we must follow the PBS satellite schedule of Sesame Street. The unaired Season 36 episodes will screen in the fall. This is when the other preschool shows star their new seasons and more kids are watching. The whole season isn't 'healthy eating' themed, just the 10 eps that have aired so far. They were grouped together for the premiere as a 'mini-season'. That's why there's repeats on now, but the full season airs in fall. Journey to Ernie and Number of the Day are still part of the show, but not in every ep. They'll air in the second block, along with the 'Desperate Housewives' and '24' parodies. And the 2-parter where Mumford shrinks Big Bird. To correct a few false rumors: Joey Mazzarino is NOT playing Herry Monster. I think talk of this came from a misunderstanding. Jerry Nelson has NOT retired from Sesame Street. He's still doing all his characters (except 2-Headed-Monster) and plenty of AMs and voiceovers. John Tartaglia is NOT playing Oscar. Mr Spinney is still playing Big Bird and Oscar. When he's busy, Matt Vogel subs for both characters. If there are other questions, maybe someone can start a thread. It's easier to keep track of them there. Thanks for the info, Squirrel. So far I haven't seen any eps past the Big Bird and Snuffy hiking episode. I was worried it was just my local station. So we still have JTE? I sort of thought they were getting rid of that for good, since not many people care for that segment. Oh well. I guess they have to give Matt Vogel a chance to perform Big Bird. How often does Matt play Oscar anyway? I'm assuming it's in "Trash Gordon" or when Big Bird and Oscar are seen together. I've never really seen anything where Oscar sounded that different so I'm wondering. Thanks for the lo' down Secret Squirrel. I feel somewhat to blame for the misunderstanding about Herry Monster. The thing is that I've got the Season 36 Character Questions thread to get help from those with better sight than me to clear up any questions about the identities of new characters for the master list. And I erroneously thought that the character talking to the kid was Herry Monster. Since then, I've tried to apologize after realizing that it was really Papa Bear. But somehow, others have clung to my mistake and run with it thinking that Joey is now voicing Herry when that was clearly a mistake on my part to begin with. Hope you have a good day, and good to know that we'll get the rest of the season later this year. wonder what ever gave PBS the idea to air the new show in the spring? probably the reason why in all the years TV has been in existance Fall has normally been the time networks have premiered new shows and episodes is because most people are out in the spring and Summertime. sure there are some exeptions but mosts Fall have been the time for new stuff. Daffyfan. Matt plays Oscar whenever Big Bird is in the same shot, and whenever Caroll isn't around. You won't often hear him. Caroll either pre-records the voice or loops over Matt's scratch track. Glad to see you back here, S.S. Thanks for the update. Interesting how the episodes were set up this season; first the "healthy-themed" episodes aired, and then mixed with older episodes. I'm a bit bummed about the rest of the series not airing until later (since by season 34 I decided to tape every episode, hoping to trade more), but it frees up my summer a bit. And thanks for the date, SSetta. 2) He has been heard in two of the new Letter of the Day "Game Show" segments as a voiceover, and he sounds remarkably like Guy Smiley. If this performer gets the chance to work with the Muppets more, is there even a slight chance that Guy may "see the light of day" again? MuppetDude. Off the top of my head, I don't remember the two AMs you mention. But the crazy game show announcer voice in those Letter of the Day segments is Matt Vogel. Matt's an amazing voice talent, but no, there are no plans to recast Guy Smiley. 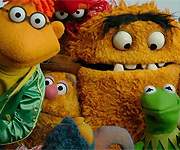 I did some checking and MuppetDude, you were right. Matt Vogel played both Gary Gill and Duck Clark. Good voice chasing! And while I can't confirm any plans to use Guy Smiley on the Street in the near future, auditions were held for someone to play Guy for the museum touring piece "Sesame Street Presents: The Body." Eric Jacobson got the part and did a great job. If you're interested in seeing it, the exhibit is at Phoenix’s Arizona Science Center through November. After that it will travel to cities around the country through 2010. They actually did recast Guy Smiley in the main street scene of a Season 30 episode(renumbered and re-aired in Season 32)in which Maria has many emergency toaster repairs. Dantecat says Guy Smiley was performed in that episode by Steve Whitmire. From what I've been reading, it sounds like they're re-running episodes from previous seasons of Sesame Street. I see. If that's the case, I wonder why Carroll doesn't record over Matt's Big Bird in Journey to Ernie. Anyway, thanks for the info. Well Carroll needs to get his practice in doing Big Bird when he can because when Carroll leaves Sesame Street permantley in a few years Matt will be doing the Bird full time. BTW I saw an episode of Sesame Street this morning. I like the fact that it focused on Some Classic Charachters for a change. Like Cookie Monster, and The Count, and Big Bird. Daffyfan. "I wonder why Carroll doesn't record over Matt's Big Bird in Journey to Ernie." If you think that's confusing, figure this out. In the ep where Mumford accidentally shrinks Big Bird to tiny proportions, Caroll plays the big Big Bird (voice and puppetry), Matt plays the tiny Big Bird (voice and puppetry) and Noel MacNeal wore the suit in a music number, performing tiny Big Bird to Matt's pre-recorded vocals.